From weak enforcement to a blank check for President Cruz, why Democrats are rebelling against trade promotion authority. The day is upon us: After months of increasingly heated debate, the House of Representatives will vote Friday on granting fast-track trade authority to President Obama and his successors in the White House. The Senate has already passed fast-track legislation, and if it gets through the House this week, it makes the controversial Trans-Pacific Partnership a near-lock to pass sometime later this year. For that to happen, Republicans will have to hold defections to a minimum, because only around 20 Democrats are expected to vote for the bill. Why has fast track raised such consternation among labor groups, economists, and progressive activists? We’ve tried to distill all the basic objections here. The White House and leading Republicans have had ample forums to make their case for fast track, and plenty of outlets have duly presented the pro-trade arguments. But here’s the case against fast track. Remember—this just concerns the actual granting of trade promotion authority, which is what Congress is considering Friday. Objections to the actual TPP pact are far more voluminous, and for another day. It’s not that enforceable. Fast-track authority is a basic bargain between Congress and a president: Legislators give away the power to amend trade agreements so that it’s easier for presidents to negotiate them without fear that all the delicate compromises will be changed by Congress after the fact. (It also agrees to lower the vote threshold for passage in the Senate—more on that rather dubious concession later.) In exchange, Congress writes in all sorts of objectives the president is supposed to follow when he or she is crafting trade deals. But Democrats have repeatedly raised concerns that the objectives in the bill are basically just gentle suggestions that the president can freely ignore. Sounds good! This is the sort of thing Obama points to when he says he has made “rigorous trade enforcement a central pillar of US trade policy.” But how rigorous is it? A closer look at the language shows the president must only “take this objective into account” when negotiating a trade deal. And it’s deemed achieved when the president writes a letter “asserting that the agreement makes progress in achieving” the human rights goals, or any others. So Obama, or President Scott Walker, can just issue a statement saying he did really think about this objective when negotiating a trade deal, and that the resulting deal made “progress in achieving” it—not that it actually achieved anything. That’s why many Democrats worry Congress is giving away its ability to shape trade deals without any real assurances in return. It wouldn’t be anything new—as Public Citizen notes, the fast-track authority used to pass NAFTA and create the WTO included objectives on labor standards, none of which were actually reflected in the resulting trade legislation. Similarly, the 2002 fast-track legislation had objectives on currency manipulation that never appeared in any of the trade pacts that followed. And the Obama administration’s record on enforcing trade deals is already not good. Moreover, the objectives in the fast-track bill have gotten worse in the House compared to the Senate version. Representative Paul Ryan successfully attached a new negotiating objective late Tuesday night—one that specifically instructs the US trade representative to ignore action on climate change while negotiating future trade deals. Specifically, it “ensure[s] that trade agreements do not require changes to US law or obligate the United States with respect to global warming or climate change.” The only small consolation here is that maybe future presidents can ignore this objective, too. 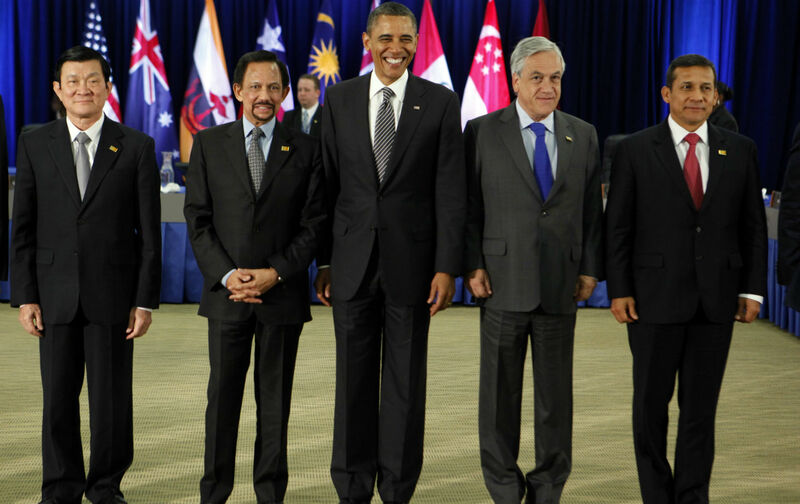 Fast-track comes way too late for TPP. Debates about the enforceability of fast-track provisions are crucial for all of the upcoming trade deals over the next six years, which is how long this authority lasts. So Congress is telling Obama what they’d like him to negotiate after he’s already done it. Because of the unusual timing of fast track, many Democrats feel like they are being bedded without a kiss on TPP. Fast-track lasts too long—and could empower the deregulatory agenda of a Republican president. When Senator Elizabeth Warren said fast track could result in the Dodd-Frank financial reforms’ being gutted, the White House got pretty mad. But Warren was unequivocally correct. We broke this down at length here, but it can be straightforward: Trade deals have the opportunity to be really bad, and fast track neuters congressional input for six more years, which will include Obama’s successor and maybe even the person after that, if the next president serves only one term. Warren specifically pointed to the TTIP, a big trade deal being worked up with Europe that could use “financial harmonization” rules to weaken several key aspects of Dodd-Frank. We know this is possible for many reasons, not least because top Obama officials have been saying publicly that they are fighting against specific provisions that would weaken Dodd-Frank. That’s nice, but President Scott Walker probably won’t follow suit. And right in the middle of this debate, the Canadian Finance Minister floated the idea of challenging the Volcker Rule—a key Dodd-Frank component—under the dispute resolution process in NAFTA, which served as an exclamation point to the assertion that, yes, trade deals can weaken financial reform. By passing fast track, congressional Democrats are making a huge gamble that no Republican occupies the White House for the next six years. Because if one does, Democrats won’t be able to amend his or her trade deals and will have limited capacity to stop the final vote. Fast-track is really hard to stop. Obama has frequently said that fast track isn’t final; that if Congress decides the process is being abused it can just disengage fast track. That’s technically true, but awfully difficult in reality. What would need to happen: Either the House Ways & Means Committee or the Senate Finance Committee could vote no on the implementing language of a trade deal. (This already is rather unlikely given both committees are heavily stocked with free-trade hawks.) This automatically generates a resolution to disengage fast track for that trade bill, but that resolution is not privileged, meaning that even in the unlikely case where one of those committees acts, either John Boehner or Mitch McConnell can simply ignore the resolution that disables fast track. Alternately, any member can offer a resolution to end fast track—but both of the aforementioned committees have to approve it, and then both chambers must vote on it within 60 days. These are extremely unlikely scenarios, and far more onerous than past legislation. The 1988 fast track that led to NAFTA allowed either committee to end fast track with a simple majority vote—no further floor votes needed. The fast track package also cuts Medicare. The House will consider three bills as part of an overall fast track package Friday, and one provides assistance to workers “displaced” by trade deals. (In Washingtonspeak, this means they lose their jobs.) But the financial aid, which Republicans hate, is paid for in part by cuts to Medicare. For all the objections, this may be the one that actually stops fast track in the House. Democrats are rebelling against the bill, because they (correctly) assume that voting not only for a free-trade deal, but one that cuts Medicare, is political poison. Boehner has said he will not proceed to the actual fast-track bill if the trade assistance bill fails, and so this could doom the entire effort. Why does fast track eliminate the filibuster so selectively? Proponents of fast track argue persuasively that a president cannot negotiate enormous, complicated trade deals with several other countries unless everyone involved believes that the US Congress won’t come in at the end and start changing everything. But fast track has two parts: it also lowers the vote threshold in the Senate to 50 votes. Why? I have not heard a single persuasive answer to this question. Think of all the things that have fallen victim to the 60-vote requirement in the Senate: a minimum-wage increase to $10.10 an hour nationally last year (It got 54 votes, but “failed”), Obama’s $447 billion jobs package that “failed” in 2011 (51 votes). Gun control legislation post-Newtown didn’t make it either (54 votes in favor). An equal-pay law in 2014 fell short with 52 votes. The 60-vote requirement in the Senate is arguably the single biggest foil to the Obama-era progressive agenda. Only now—for a trade deal molded and favored by corporate elites—is it finally being scotched. Why?